Zambia National Service personnel deployed in border areas across the country should ensure that the rampant smuggling of mealie-meal and maize grain is stopped forthwith, ZNS Commandant Lieutenant-General Nathan Mulenga has directed. 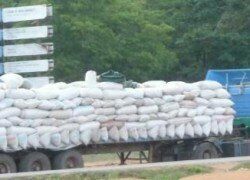 And ZNS troops at Kasumbalesa alone have impounded 21,000 x 25 kg bags of mealie-meal since the anti-smuggling operation started just over a month ago. Lt. General Mulenga made the directive when he visited ZNS soldiers deployed to curb the smuggling of mealie-meal and maize grain on the Copperbelt. Lt. Gen Mulenga, however, expressed satisfaction that the vice had so far reduced since the servicemen were deployed a month ago. But he said a lot more still needed to be done to help the country remain food secure. Lt. Gen Mulenga warned the servicemen not to fall prey to bribery and corruption for selfish reasons, saying the interest of Zambians should always come before self. He urged the servicemen to be wary of selfish businessmen who would stop at nothing to ensure they made huge profits for themselves out of smuggling of mealie-meal and maize grain at the expense of the majority of Zambians. “We should not allow a situation where the country runs out of grain or mealie-meal even after having had produced enough because of unscrupulous businessmen. That would make this nation ungovernable. As men and women in uniform, we are men of honour who will not accept to sell this country for 30 pieces of silver,” Lt. Gen Mulenga said. He reminded service personnel deployed on the anti-smuggling operation across the country that the riches of a soldier lay not in monetary gains or any other bribes but his integrity. Meanwhile, ZNS troops at Kasumbalesa have impounded close to 21,000 x 25 kg bags of mealie meal since the operation started just over a month ago. President Edgar Lungu recently directed the ZNS to deploy troops to the border areas to reinforce measures to curb the rampant smuggling of mealie-meal and maize grain, a situation which had threatened the food security of the country as the commodity could not be accessed by ordinary Zambians in the shops.